Bike to Work Events: What are They For? 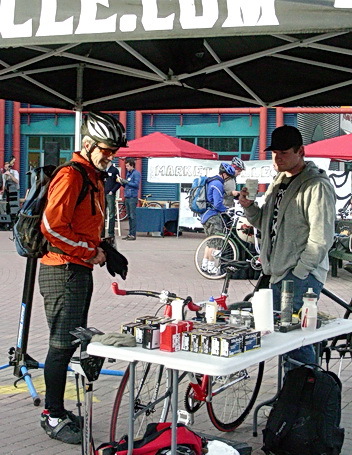 May 6, 2011 was Bike to Work Day in Calgary, Alberta. Cycling from bike station to bike station with a pancake top-up along the way, a reoccurring question came forth again. Who are the customers of these bike stations and of Bike to Work campaigns conducted on streets? These bike or celebratory stations are intended to be encouragement for current commuter cyclists. Bike to Work is intended to draw out people who are new to commuting. So these stations are a way to encourage them to cycle to work and are a sort of a positive “you have done well” slap on the back to make them feel that they are not alone but part of a cycling commuting community. 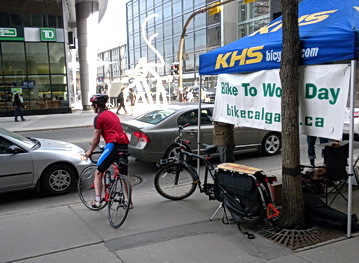 The Bike to Work stations are there to appeal to drivers to give cycling to work a try as an alternative to driving. The cyclists stopping at the stations are there to show drivers that it can truly be done. Each of these scenarios has effect on location selection, on orientation of bike stations to drivers and to cyclists, and on signage. For significant cycling mode share growth, drivers are the most promising customers for marketing pitches to make a modal shift to cycling or combine mobility with transit and cycling. If properly oriented and signed, bike to work stations can be a powerful tool for marketing to drivers, especially locations where a lot of cyclists congregate. Cycling turnover is a potential for losing some gains of the already achieved modal conversions to cycling. A cycling planner in a mid-sized European city with a 25% cycling mode share estimated that if social marketing programs should end, the cycling mode share would deteriorate by 2% to 3%. This estimation would support cyclist-focused bike stations. If data was captured at these stations, on the percentage of cyclists stopping versus continuing past the station and supported by a simple survey, then some assessment could be made on the importance of these stations on dedicated and committed commuter cyclists. The survey should test for time span and commitment to commuting cycling. With the goals in mind for cycling within a liveable city-community, then a strategy for bike station location can be developed to support the city’s goals with an appropriate focus on drivers, on newbie commuter cyclists, and on dedicated commuter cyclists. Bike to Work Day. Calgary, AB May 6, 2011. Photo by HJEH Becker. Set-up just after 6:00 am. 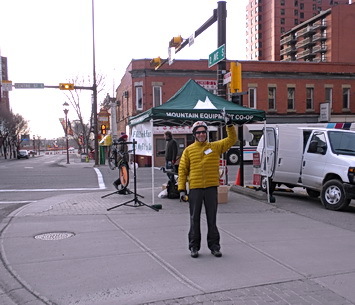 By observing locations of the Calgary stations, it was not clear what the objective of the day was. Anecdotally by observing the passing cyclists, they seem to be dedicated commuters, not sensitive to the elements or snow unless it gets too deep. Winter studs on their tires are not something foreign to them. They seem to be hardy cyclists dressed for the weather, not for cycling chic. Helmet use was very high. Cycling speed was fast where trip time is a consideration. One of the cyclists noted that he does a 30 kilometres trip each way from home. 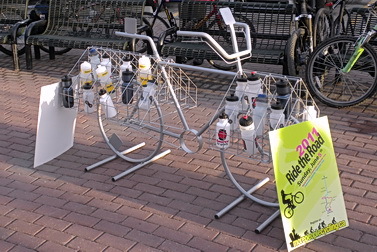 Seven bike stations were distributed around the downtown core of the city. Four of the stations were along the bike path systems of the Bow and Elbow Rivers. These paths are part of the major arterial cycling network for commuters, all year round. One of these stations was adjacent to an arterial road. The other 3 stations were on the corners of arterial roads on the periphery of the downtown core. At the most westernly station, cyclists flew across a narrow pedestrian and cycling bridge positioned under the C-trains as they make their crossing over the Bow River. 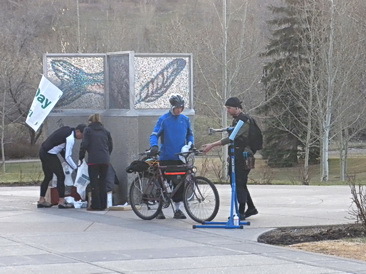 As they approach the riverbank, the brakes are applied fully so that a tight right turn could be maneuvered in time to hit the brakes even harder to stop in front of the bike station tent for an apple. This station was not visible to car drivers or to C-Train passengers. The station just served commuter cyclists. At the next station, the location was removed from view of passing motorists in the middle of an island. 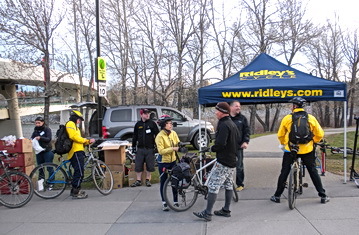 Again definitely there for commuter cyclists, the station was minimal and without a tent. However, Eau Claire Market was just a short ride away over a bridge. 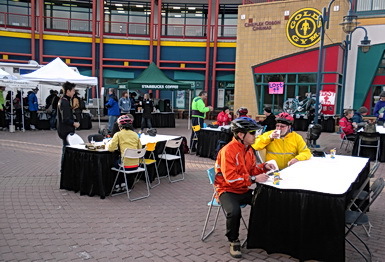 Eau Claire Market is well hidden from car commuting traffic and located on a residential street. Wonder if the early music woke up the residents across the street. arterial road while cyclists flew by the station. As one volunteer said, with speed of cyclists approaching 40 kilometres per hour, it was no a wonder that there were few stopping. However, from a messaging perspective for motorists, this site was well located. 4th Ave and the Edmonton Trail, a couplet of high-traffic, one-way, multi-lanes arterial roads intersect Memorial Drive on the north side of the Bow River, then pass over the bike path and continue on two bridges to the south side. The bike station is located about 20 metres from the bridge end down a small knoll. The visibility of the location is not ideal for either cyclists or for motorists. Southbound cyclists are a bridge away, maybe 40 metres or so. Cyclists along the river path are on their way down the underpass under the couplet roads by the bridge. Since the path to the station includes a small hill climb, it is possible that the cyclists may not see the station. The station is beyond the view of passing motorists on this linear park. This site does not seem to serve promotion of cycling to drivers or to cyclists very well. With more volunteers, then one could have spotters at the side of the road with a bike to work banner and spotters on the path encouraging cyclists to visit the station. After all, high cycling volume at stations is good advertisement to the drivers. 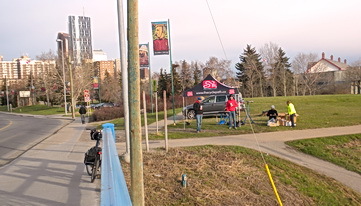 At Fort Calgary further along the path on the Elbow River, a station was set up close to an intersection of a cycling underpass and a surface path leading to a bridge on 9th Ave. SE. The location did not serve cyclist well as they had to swoop up the underpass and divert out of their way to get to the station. Meanwhile, the drivers coming over the bridge had their view blogged until the last minute by the structure of the bridge. 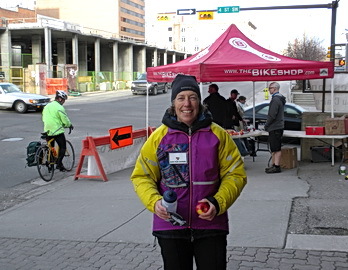 The location did not allow the volunteers to greet cyclists emerging from the underpass who were continuing along the trail in the opposite direction or wave to motorists with a huge grin as cars pass by. Marketing opportunities were lost. The next station is well located for high visibility for both motorists and cyclists. It was perched on the sidewalk on the northeast corner on 10th Ave where 4th St starts its decline under the railway tracks into the downtown core. The cycling traffic was significant on these roads. 10th Ave is a designated bike route on a collector street with capacity for 4 lanes depending if any cars are parked along the curb. 4th St is one of the few streets, which cross the railway tracks. The last station was also very well positioned right on the sidewalk and by the curb on 8th and 8th. It would be hard for the motorists going downtown on either street to miss the bike station. 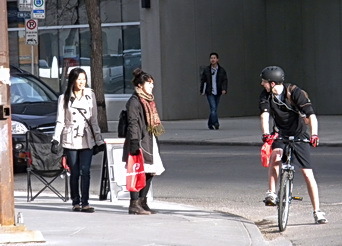 Two volunteers were positioned across the street with their easy chairs, stopping cyclist, and giving them their bag of goodies. 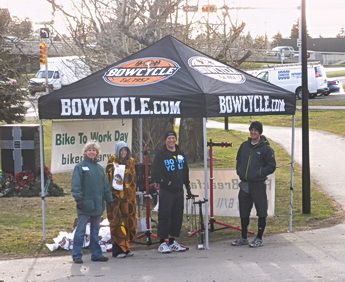 The Bike to Work Day event was well planned and carried out. Many fast, dedicated cyclists whisked by the stations, calling out that they were committed cyclists or had forgotten to add extra time to their journey for a stop. Others had stopped. Some gave their bikes to the mechanics for a quick adjustment. The cyclists were hard-core commuters and reaching their destinations was a prime driver. The bicycles were not your daily commuter bikes having weathered many years. Very few cyclists were women. Parents towing children was a rarity. The stations were somewhat visually sparse in appearance to attract you to them. An estimate for activity levels at all the stations seems to be 1,000 cyclists stopping by. I’m so impressed by the organization around the Bike to Work day. I did it a couple of years ago (biked – not organized) and I was like a freak. Really? It’s bike to work day? I love the commuter stations and what a sense of community. I’m going to share this post with friends here locally to see what we could do, if anything on a smaller scale next year. Hope your cycling group keeps up with Bike to Work Day. It does require, in particular public outreach in advance. If you can tie it in with a group bike ride that helps the bonding of lone cyclists too. Different cities do different things. I noticed your interest in food growing and gardening. Does your area feature a regular farmers’ market or something similar? Maybe choose some sort of sustainability theme and have a group ride out to a farmers’ market, etc.